Kohima, the capital of Nagaland is the most popular destination due to her close proximity to Kisama Heritage Village, the venue for Hornbill Festival. Also, Kohima is the base to reach other parts of Nagaland due to her recent infrastructure development. However, this hill station has seen exponential growth in last couple of years and it can get congested as traffic tends to move at snail's speed. Despite high number of vehicles, the streets are free of traffic jams and gridlocks thanks to the civic sense of the people of Nagaland. They follow lane discipline, patiently give way to other vehicles, pedestrians and do not honk unnecessarily. We only wish this incredible feat could be implemented all over India. We started our tour in Kohima by visiting one of the most brutal battle grounds where the allied forces stopped the Japanese advancement- "Battle of Kohima." Once sprawling bungalow of the Deputy Commissioner was reduced to rubble after the war. As a reminder of the sacrifices of the war heroes this Battle field has been converted to a cemetery. This is the final resting place of more than 1420 soldiers who laid down their lives defending India during World War II. A Cherry blossom tree is of historic importance here. The original tree was used by the Japanese forces as a sniper post. However, the tree was damaged during the war and the present tree is a shoot from the old stump. Kohima state museum located in the corner of a busy lane is a perfect place to see art and artifacts belonging to the different tribes of Nagaland. The collectibles are simple and are all made of natural material but excellent when it comes to serving the purpose. The ones that stood out the most were different kinds of indigenous traps for birds and fish. Apart from that, a brush made of jack-fruit and it took us a while to believe that it could even be possible. Another very freaky exhibit that made our jaws drop were the skulls displayed that are real headhunting trophies collected during raids. Outside the museum is a small open air gallery that houses many centuries old relics. The statues though damaged still have a classic appeal and the most lively one being that of Shiva killing a demon. Kohima tends to host a lot of interesting football games and next to one of the football fields was a second hand clothing market where goods were being sold at a throwaway price. While on one side we saw a lot of folks work really hard to make money, the other side was the stark reality and one of the biggest challenges our Nation is facing- 'Illegal Gambling.' Illegal gambling happens in the open and on a massive scale, it was disheartening to see a young chap lose around 10 thousand rupees in under two minutes. It reached a point where after losing everything, he yielded to the temptation of borrowing money and ended up losing that as well. This just goes on to prove how addicting and home wrecking gambling could be. Just for the heck of it we did try our hands at gambling, started with Rs.400 and almost lost all of it but lady luck shined and we made Rs.300. Being a part of the game we soon realized how the dealers work. It is more of a con, a group of men all working together make it look like the dealer is losing and there is easy money to be made. Once unsuspecting players bet big the house ends up winning everything. The greed to get back not just the investment but make profits is the root cause of getting trapped in this vicious cycle. Mind surely plays games. We called it quits after making Rs.300 and all of this happened in just 3 chances. The best time to visit Kohima would be around Hornbill festival and during this time the entire city is pumped up. There are plenty of competitions organized by the enthusiastic local government and other bodies. A few to mention are photo competition, half marathon, music competitions and football. Many of the events had entry fee with exceptionally good price money and it was open for non locals too. 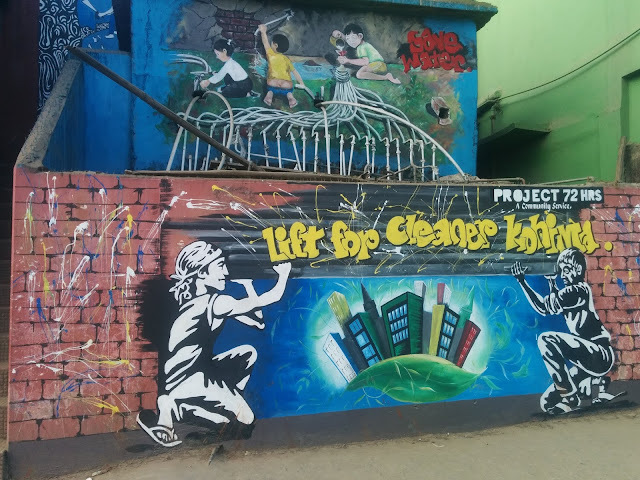 With abundant growth, pollution also becomes a reality and to curb this, local NGOs have started promoting the message of a cleaner city in a creative way. 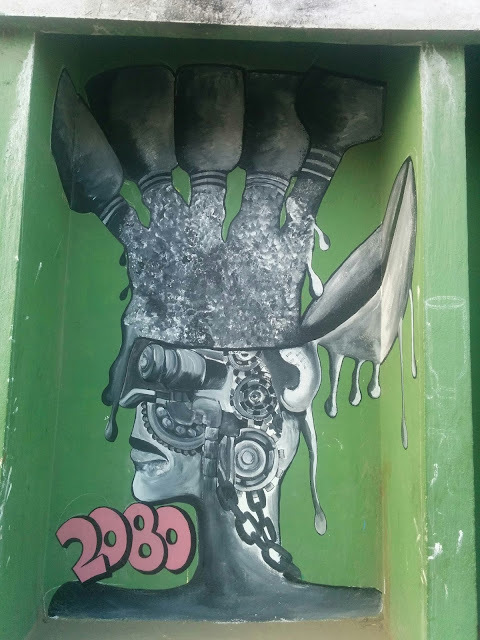 The graffiti on the walls of Kohima is something that is beautiful and filled with messages to educate people. We took a stroll around Kohima and walked into one of the busy markets that was selling not just vegetables and fruits but also live frogs, snails, worms and insects. The restaurant Shilloi Lake in Hotel Jafpu serves good food and is reasonable priced. Their hot and sour soup is a must try. When it comes to small bites, Popular Bakery is a perfect stop. 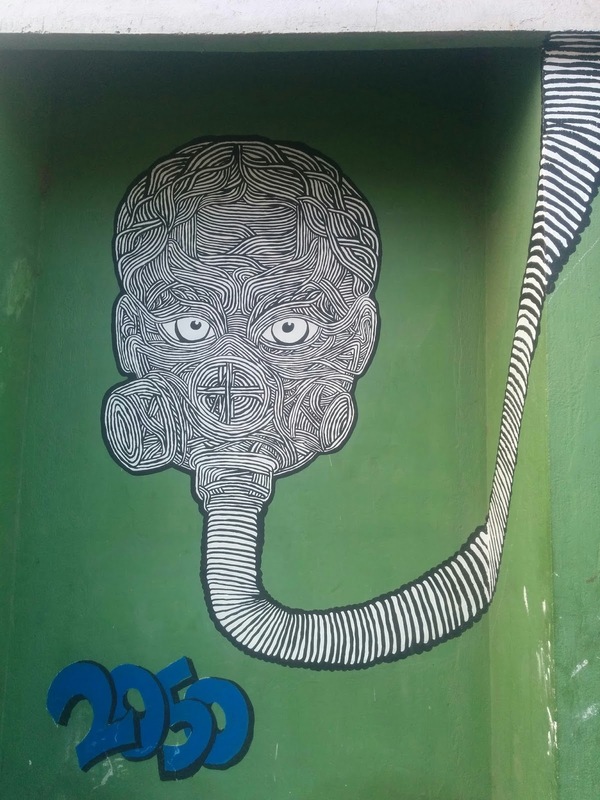 True to their name, they seem to be very popular and have outlets across Kohima. 'Planet Earth' restaurant near Kohima town junction is one of the best cafes in town to dine in. They specialize in Chinese cuisine and is also easy on the pocket. Their red velvet cake is awesome and a must try. 'Ozone Cafe' in the same area gives it a super tough competition. If you are in Kohima this place is a must visit, alongside an awesome menu they have an in-house library. The food tastes awesome and the pricing is very reasonable.Their milkshakes are a must try. Another awesome aspect about Nagaland in December is the Christmas celebrations. 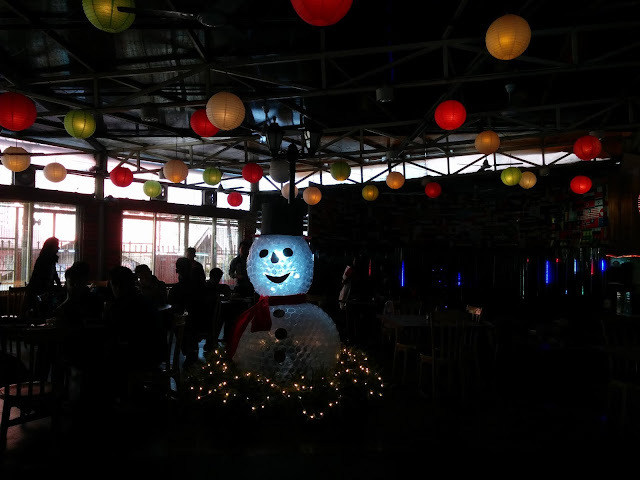 Christmas is jubilantly celebrated in Nagaland and it was in Ozone Cafe we saw the best of snowman made out of plastic cups. We got a taste of the festive spirit when on our way to Kohima we got down from the bus at a wrong stop and lost our route to the hotel. We were stranded in a dark street with maps not functioning and loaded with our rucksacks we were speculating our next steps. A kind gentleman who was with his family, spotted us looking totally lost and confused, offered to drop us to our hotel in his car. This generous offer to complete strangers touched us no bounds. It is definitely difficult to trust complete strangers and offer them lift especially when one is travelling with family but this man and his family changed our thought process completely. The next day they dropped by to check if we were comfortable at the hotel and even invited us to their home and prepared a feast like dinner for us to enjoy their cuisine. This beautiful family turned out to be our Angels spreading the joy of giving and we truly got an insight into Naga lives, their cuisine and also their lifestyle. They even treated us to amazing rice beers. We checked into Hotel Aurora at Traders road. A budget hotel with excellent and quick service, it had clean rooms and was total value for money. The best part is their restaurant that serves amazing food at a very reasonable price. Their continental breakfast is amazing and so is their Indian and Chinese cuisine. They offer free WiFi and is centrally located with buses and taxis easily available. you covered this beautiful place Kohima brilliantly .